...ONLY If You're HUNGRY For 'EXPONENTIAL GROWTH' In 2019! Would You Like Me To Personally Double, Triple or even Quadruple Your Revenue (& Business)...For FREE? If you want to experience massive sales, outsmart your biggest competitors, and exponentially grow your revenue and business, this is the most important letter you’ll ever read. Imagine what it will be like to double, triple or even quadruple your sales in the next few months. Your revenue will skyrocket…your profit will hit the roof. You wouldn’t have to spend hours and midnight worrying about your business anymore. Does that sound like a thing you want to experience, right now? One of my clients (and now friend) who is in the travel industry was about closing shop as a result of the 2016 recession. Her business was badly hit and she just decided the best thing to do was to close shop. She couldnt pay her bills. She couldnt pay her workers. She was completely FRUSTRATED having tried everything she knows and she was told. Nothing frustrates an entrepreneur like not knowing where your next customer or sales will come from. The major reason most entrepreneurs get frustrated and want to give up is because of lack of consistent sales and growth. Anyway,this lady reached out to us for help. We got working together and something dramatic happened. First, we were able to generate 2.5million into her business in less than 24hours without spending any money on advertisement. After a few months, we developed some marketing strategies which she used to attract 'top level' premium clients. She got premium clients and within a few months, she took her 'dying' business to N80 million naira in revenue. Today, she is very happy and feels fulfilled. Life is great. Business is doing fine. Listen, I can help you replicate the same result, i'll tell you more about how i can help you do that for FREE but let me tell you the story of another amazing entrepreneur. From 'No Sales', To 'OVER SALE' and Rapid Revenue Growth. Elera is an amazing client (and friend) of mine. When we first met, she was in tears. She told me that she had spent over 25 million naira in starting the business but it appeared her competitors were using 'juju' on her. I wont blame her for thinking so, we are in Africa. You know when you get to a point of frustration, you begin to think all manner of things. She said she had done everything within her power and it appears the business will never ever grow. Paying salaries and bills were becoming big issues because sales wasn't coming. She started depending on luck. She wasnt sure where and when her next customers will come. They will cook great meal (because she runs a restaurant and lounge that is located in a high brown area) but people will not come in. It's NOT because her business wasnt in a good location, she's actually in one of the best locations any business owner will dream of. It's NOT because the place was not very fine, she stays in an entire duplex and it's a lovely place. It's NOT because her food wasnt good. As a matter of fact, she cooks really, really well. Yes, she does. I should know because recently i hosted a business event in Portharcourt that brought over 350 entrepreneurs together and she forced me to her restaurant. Look at the picture of what she served me. The food is sweeter than the looks, i know because i eat ONLY good food,LOLz! So, why was she not growing despite all these great stuff that she has going for her? It's simple, growth was broken in her business but the good news is that if you're in a similar situation, I can help you fix that, more on that later. Sales and customers are the 'live blood' of every business. The more sales you get, the money more you will have in the bank. The more money you have, the more your business will grow,period. We helped her changed every single thing. If you want to massively grow your sales, double, triple or even quadruple your revenue and experience 'real growth', I can help you but i'll tell you more about that. 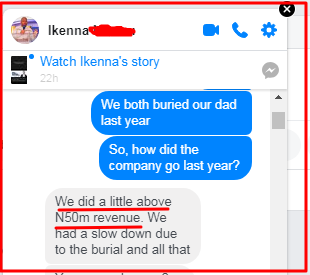 My dear client (Ikenna) wanted to grow his company really fast. He wanted 'good clients' and he needed them URGENTLY because the business was on 'oxygen'. One thing i love about him is that he's a very,very passionate guy. He loves what he does and does it so passionately. Let me tell you, it is not weather of not, I and my company can deliver great result to you, it is weather or not, we will even like to work with you. Anyway, we did something great for this guy. After working with his company for 6 weeks, i asked him to update up on revenue. I mean, here was a company that was even struggling to make 500K and was on 'oxygen'. It even got better because after 4 months i asked him to update me on revenue and here's what he told me. 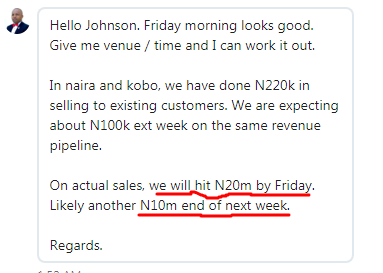 You saw that right, they did well over 50 million naira in revenue. He's extremely grateful to my company for the help. I have had the opportunity of working in more than 42 different industries and some are the most competitive industries on earth yet I am able to crush it and find a unique advantage, and I’ve done the same for tons of companies. but in reality they are nothing compared to what I’ve done for many of the bigger brands I’ve worked with. I’ve gotten so good at helping companies get grow their sales, acquire more customers fast and exponentially grow revenue that I now have over 1,500 people competing to work with me each MONTH. Like when 3 top companies each bought 2,000 of my book or when a top CEO flew all the way from Enugu to Lagos to come spend 90 minutes with me. He still calls it 'the best 90 minutes of my life'. If you want sales, more revenue and growth, we can help you grow fast and the good news is that we'll do it for you for FREE. The first thing I’m going to do for you is to help you create a 'well-oiled' customized business growth blueprint specifically for your company to help you get more sales,customers and immediately bring more money into your business. There’s no charge for this and it only takes between 45 to 90 minutes for me to do. First, we will completely review your business and see what is working well and what isn’t. We’ll spy on your competitor and develop immediate plan of action to crush them, we’ll analyses your target market so we can identify the exact people who will happily buy from you. We’ll analyse your current sales process and your sales goals, we will restructure your offer for a better price point so that you can make more money, we will pull in new buyers from untapped revenue sources so you can generate even more revenue, we’ll reactive past buyers and make them buy more. We will even help you get consistent inflow of premium clients and many, many more. The time we are going to spend together is going to be completely 'transformational' for you and your business. There are a whole lot of things we will do, and like I said, there’s no charge for this, it is 100% FREE. The business growth blueprint I’ll develop for you for free is going to be an absolute ‘game changer’ for your business, and it’ll take your business to the ‘next level’. So, why I’m I doing this for FREE? First and foremost, this is the kind of thing I love doing. Nothing makes me happy like helping people grow their sales, acquire more customers and exponentially grow revenue. It gives me 'unexplainable satisfaction'. Secondly, this is how I attract top-level-clients. ​So, assuming you’re happy with the customized business growth blueprint i will design for you, you might want to work long term with my company to help you rapidly grow your sales,revenue and business. If this is the case, I might invite you to become a client if I feel that you’re the kind of person I will like to work with. Our fees starts from 'high level' 6figures to 8figures and even 9figures in some cases but depending on where you're and where you want to be but our results are life-changing. I’m not one of those people who promise ‘heaven and earth’ and deliver nothing. If you are looking for a 'cheap' guy, I'm NOT one. I'm very affordable for the right kind of person. Royce Rolls is what it is for a reason. Working with me means working with the 'best of the best', It means working with a 'game changer'. It means working with Africa's #1 'marketing influential' according to the recent report by Africa.com, they named me as Africa's #1 marketing influential. I'm incredibly passionate about growing businesses and if you've ever come around me, you'll see it visibly just like this lovely woman below. If you're lucky and I agree to take you on as a client, you can be assured that you’ll rapidly grow your sales, acquire more customers fast and exponentially grow your revenue. And if you don’t want to become a client, that is fine too. No body from my office is going to pressure you to become a client. It is a taboo to us to pressure anyone. We don't pressure people to become client, NEVER! I believe the exact opposite will happen, you'll be the one chasing us to become a client just like this lady below. Infact, I believe that you’ll be the one begging to become a client because you’ll see the value in the customized business growth blueprint that we'll design for you. You’ll find our conversation to be incredible valuable or I’ll compensate you with $100 for your time. Your time is the most important asset you have and I respect that. I’m so certain that you’ll enjoy our session together and if for any (strange) reason you don’t, I’ll compensate you with $100. I’m also guaranteeing that you’ll find it extremely valuable for your business or I’ll immediately compensate you with $100 for your time. Who else is doing this kind of thing? Talk is cheap. Everybody can make promise but how many can put their money where their mouth is? The last time I checked, nobody is (or can) do this sought of thing but I can do it because my clients ALWAYS get amazing results. I know my stuff and my stuff works, period. 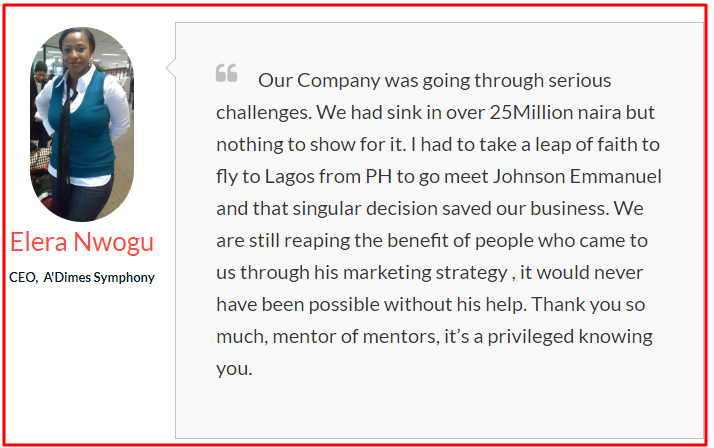 Afterall, I’m Johnson Emmanuel- Africa.com recently listed me as the '#1 marketing influential' in Africa and they called me the 'top marketing mind' on the continent...I build great companies. That is why celebrity entrepreneurs, top executives and business owners of all type come to me for help. I have shared the stage with billionaire entrepreneurs Richard Nyong (Lekki Garden CEO), Akinwande Ademosun, Femi Osibona amongst others. See, my stuff work, and if we work together, your business will grow rapidly,period. Again, I know that if we work together, I’m certain that I’ll be able to transform your company. As you can imagine, a lot of people will be reading this and over 1,500 jostle to work with me monthly but this opportunity is NOT for everybody. This is NOT for everybody. Here’s who I can help. I’m very picky about who I’ll speak with and I’ve got a strict (but reasonable) criteria that needs to be met in order for us to proceed. You MUST already be in business. This opportunity is for people who are already in business. People who are already running but simply want to run alot faster and further. You should be already in business and already making some good money, may be SOLID 6figures or 7 figures per month. Oh, it's NOT for beginners, ‘get rich quick’ people and people of the likes. You MUST be ethical and should have a 'long term' mindset. Most entrepreneur believe in 'get rich quick' or 'push button success'. I DON'T. You MUST be ethical,must believe in hard work and consistent massive effort. You MUST already be in business. You must have a good solid product and a good reputation. Everything we’re going to do together will not only bring you massive sales and profit, but we will do it in such a way that it brings you massive goodwill in your market place. Inorder for us to do that, you need to get your act together. This means that you should be making some sales already but want to make much more. You’re already running ads or ready to start running ads. You really don’t have to be ‘everywhere’ or ‘huge’ but I need you to be PRESENT in your market so my help will make a huge impact in your business. 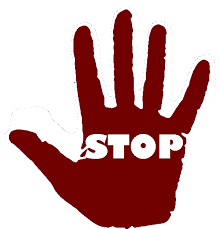 If you don’t implement the stuff I’ll give you, you wont make any money.So, I need you to be an action taker. I need you to be teachable,coachable and ready to take immediate action. You must be willing,able and ready to invest (financially and otherwise) in yourself and your business immediately. Yes, you MUST have the wiliness, ability and readiness to invest in yourself IMMEDIATELY. We don't want to spend our time with excuse makers, procastinators, tired kickers or people who don't believe in selfinvestment. That’s it, those are all my 'small' requirements. If you meet the above requirement and want me to personally help you grow your revenue and business, I’m very excited to speak with you, I’ve set out some time to help you today. 1: You need to fill in a simple application. Don’t worry, it’s very simple and unobtrusive. It’s a form that asks for your name, what kind of business you want to start, where you are now and where you want to be. 2: I’m also going to ask you for a ‘real person’ Refundable deposit of N10,000. See, I don’t care about the N10,000. I’ll send it back to you immediately after our meeting. I’m only using it as a ‘filter’ to keep away unserious people and time ‘wasters’. I need to be sure that you’re really hungry for growth and also keep the ‘time vampires’ at bay. I’ll send back the N10,000 to you immediately after our meeting (unless I take you as a client, and in that case-I’ll apply it to your balance). Eitherway, you’ll get back the N10,000 refundable deposit. I’m just using it to keep unserious people at bay. Once I have your ‘real person’ deposit and your application, Nancy Igwe, one of my amazing staff will immediately schedule our meeting. She’s my ‘right hand’ woman, one of my best and trusted workers who is amazing at what she does. So, she will schedule our session. Our session will be between 45 to 90 minutes. This is really where we begin working together to figure out exactly what you want and how to make it happen immediately. We’ll painstaking review your goals, your current sales process…and we’ll deliver a plan to help you grow your sales, acquire more customers and exponentially grow revenue. If you see the value in that and want to become a client, we can talk about that. No matter what happens, you’ll come out as the winner. This opportunity is extremely limited because of the intense one on one time needed inorder to provide you with results. Also, you need to realize that there’s a very huge demand for one-on-one help from me, and what I’m offering you is unprecedented. Every single month due to the HUGE volume we run in our company, more than 1,500 apply to work with my company every single month. I cannot guarantee you a slot if you leave this page. The best thing to do is to click the button below to get started right now. So with that said, know that this widow of opportunity wont be open for long. Click below now.